This banner is displayed at the Institute of Lassa Fever Research and Control in Irrua Specialist Teaching Hospital in Irrua, Edo State, midwest Nigeria. It's the worst Lassa fever outbreak ever recorded in Nigeria, according to the World Health Organization. "In January alone there were more cases [203 suspected cases] than during the whole year 2017 combined," says Lorenzo Pomarico, emergency coordinator for the medical group ALIMA, the Alliance for International Medical Action. "This is an extraordinary and unprecedented outbreak in its sheer scale." Last year, Nigeria had 143 confirmed Lassa cases. In 2016, they tallied 109. So far this year, they've had more than a thousand suspected cases and 365 confirmed. And it's unclear why these numbers are going up so dramatically. Over the past week, there have been 12 more confirmed cases and four additional fatalities, bringing the death toll to 114 since the outbreak began in early January. While researchers still haven't figured out why the virus is spreading so fast, they do know the main culprit in this outbreak — rats. "The most likely route of transmission continues to be spillover of viruses from the rodent reservoir to humans rather than extensive human-to-human transmission," the Nigeria Centre for Disease Control (NCDC) said in a report last week. "Spillover" in non-scientific terms looks like this. Rats carrying the Lassa virus scurry into people's houses, munch on their grain and pee all over the place including the grain. Then people eat the grain and get sick. 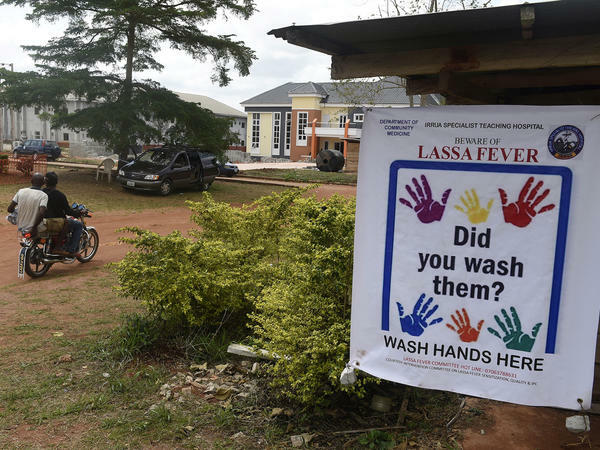 Lassa, named for the town in Nigeria where it was first discovered in 1969, is a hemorrhagic fever, like Ebola. Some people who get infected have few or no symptoms. Others get what appears to be a mild flu or malaria. Severe cases can lead to renal failure, deafness and, for pregnant women, spontaneous abortion. While Lassa can be deadly, it has a lower fatality rate than Ebola. More than half of confirmed Ebola patients die versus roughly 20 percent of people with Lassa. ALIMA has brought in veterans from its Ebola response in Guinea to set up an isolation ward on the grounds of a government hospital in Owo in Ondo State. "The isolation and infection control procedures for Lassa and Ebola are pretty much the same," Pomarico says. "You wear personal protective equipment. That's the hood, the surgical gown, goggles, special boots," he says. "It's a very comprehensive set of materials that protect you from bodily fluids because that's how interhuman contagion happen." And as with Ebola, human-to-human transmission of Lassa fever can wreak havoc in hospitals and clinics. So far in this current outbreak at least 16 health care workers have been infected, and four have died. The NCDC has been scrambling to test more than 1,300 suspected Lassa cases from all over the country and is also running genetic sequencing on the blood samples to try to determine how the virus is spreading. So is Nathan Yozwiak, associate director of viral genomics at the Broad Institute of MIT and Harvard. Yozwiak has been studying samples of Lassa virus gathered during this current outbreak and from previous years. So far his research suggests that the transmission is primarily not human to human. His lab can also spot whether the virus itself is changing and possibly becoming more virulent. Yozwiak says that doesn't seem to be the case. "So there could be something going on with the rodent population," he proposes. Maybe something's happened in the environment that has led to a rat population explosion. And that might be the problem, he suggests, noting that Nigeria recently had an outbreak of monkeypox, which is "also transmitted by rodent vectors." Another theory is that Nigeria is reporting more Lassa cases this year because more people are aware of it. "What we could be seeing rather than an emerging disease is an emerging diagnosis," Yozwiak says. Nigeria has been scaling up its capacity to detect, track and treat infectious diseases. The country has been on high alert since its cluster of Ebola cases during the 2014 West African outbreak, he says. And it has teams scouring the countryside for polio cases after the disease re-emerged in Nigeria in 2016; those health workers might be detecting Lassa cases. Identifying the virus is also easier. There are now three labs in Nigeria that can test for Lassa virus, while in the past, samples were sent to South Africa. So Nigeria is primed to find more cases. Yozwiak also notes that there's no geographic center to the current Lassa outbreak. Cases are being reported all over the place and don't appear to be related to one another.